The Stamile Padel Founders Cup finalists! Play padel until the cows come home! Camaraderie is one of our best qualities! 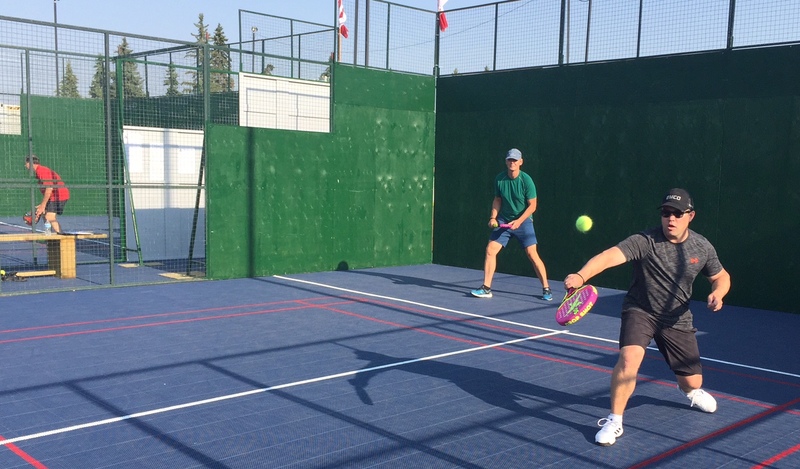 Play Padel at the Calgary Padel Club! 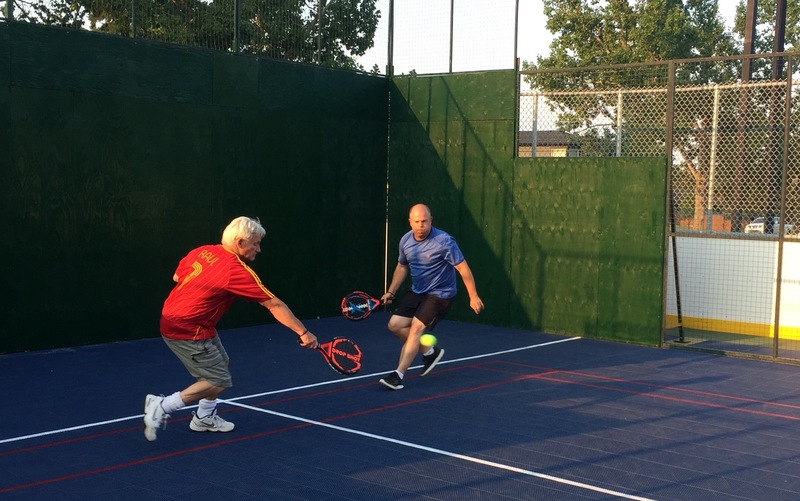 The Calgary Padel Club is the best place to play padel in Canada! And the only place where you can find certified padel instructors! Our main goal is to help develop the sport of padel in Canada (also known as paddle). If you are new to padel, just come out, you’ll have a blast. We have friendly people to play and socialize with, loaner padels, balls, everything you need to start playing padel right now. We encourage tennis players, squash players, racquet sports players in general to come and try padel, you will get hooked on the fastest growing sport in the world! No matter if you are a member or not, just come down to play PADEL! We have a full clubhouse with dressing room and washrooms. The lights at the padel courts are on until 10:00 PM. For those occasions when you need to resolve an on court debate over a point, we offer our Rules of Padel and some convenient Q&A. Bill Stamile is the founding father and the biggest promoter of the sport of padel in Canada. Padel would not be played in Canada today were it not for Bill’s relentless persistence and sheer will to keep our game alive that at times were against all odds and often single handedly. Padel is a fun sport that can be played by everyone. If you’ve ever played tennis, squash or any other racket sport, you’ll have no problem playing padel… and we know you’ll love it! Play PADEL till the cows come home! You will play more padel that you ever hoped at the Calgary Padel Club. Just come to the drop-in nights or weekend events and play! There are always lots of people to play padel with, and you’ll mix and mingle. Even when the courts are very busy, our maximum wait time is only about 15 minutes. Our padel courts have excellent lighting and a rubber surface that is very forgiving for the joints and back. The lighting system allows us to play late into the night. For the newcomers, we have a nice selection of loaner padels and we set you up with other players so you can start playing padel right away. We offer complimentary padel lessons every Saturday, provided by certified padel instructors. Get in Shape Having FUN! Padel is a fun aerobic workout for the whole family. If you have an expensive gym membership, but you have to drag yourself to go, or that tough aerobics class… just forget about that and come to play PADEL. For a ridiculous low membership price you’ll have so much FUN and you won’t even know you are working out. Come to the club and try it out! Find out what this great sport is all about. We have Top Brand padels for sale. We worked out special deals and we are passing on the savings to you. Send us an email if you are interested or drop by our Pro-shop. Andres Stamile, Certified Padel Pro and Coach, shows us how to play the various shots in Padel through his series of short videos. CPC follows all rules and objectives of the International Padel Federation to help grow and promote the sport of PADEL in Canada. February, 2018 – We congratulate our very own Bill Stamile, Sr. Vice President of the International Padel Federation, for having achieved such a great step. A major milestone achievement for the FIP, as they received the Official Global Association of International Sports Federations (GAISF) Observer Award in Switzerland. See our PADEL FRIENDS Around the World!